The last weeks has been rather busy, with the release of the Jörgensen Sample set, and on top of that I just did a large Hauptwerk installation in a local Church. 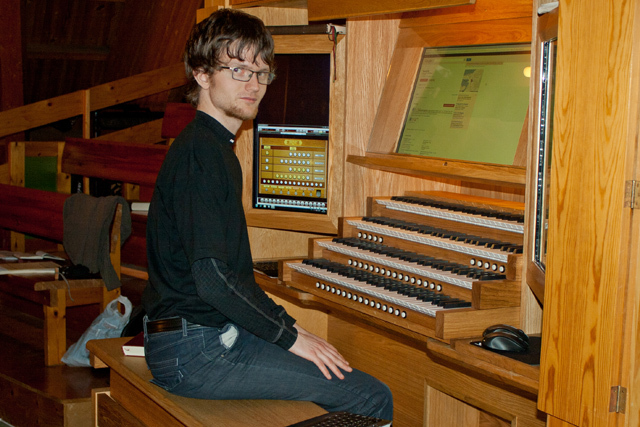 Below is a link to a video from a large Hauptwerk Organ installation in Volsdalen Church in Ålesund, Norway. The delivery was done on Dec 14th, 2011, and the organ is already fully functional and in use, although the official opening is on Christmas Day. The clip was first screened on local TV, and then on National Television in the main news sending in the evening. The delivery consists of a large Hauptwerk installation with dual embedded touchscreens and a dedicated computer for displaying notes in PDF format in the center. All the woodwork is custom made in oak, and fills the entire area of the old removed organ desk. It has a 4 manual keyboard stack, a 30 note pedal, 3 Swell pedals, and 42 integrated buttons for registration, and additionally there will be 16 foot pistons. The prior organ facade and blind pipes are kept as is, but behind them there is now an array of 16 speakers in addition to a dedicated 16′ SubHorn Bass system. To drive the sound there are several amplifiers pushing ~220 watts for each channel. 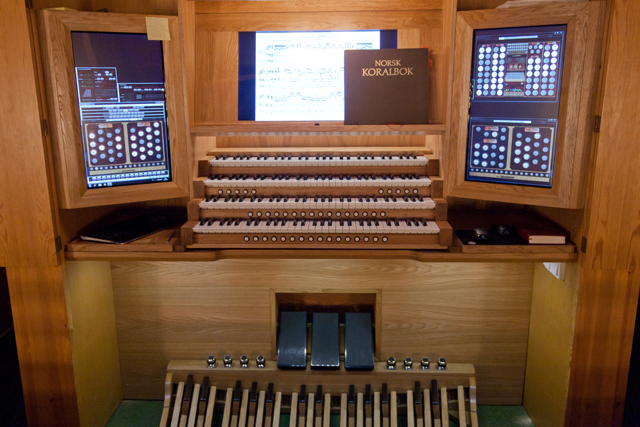 The cantor has selected a variety of dry organs suitable for the Church, and I am happy to report that the Jörgensen organ is among the ones selected! The first installation in a Norwegian church? 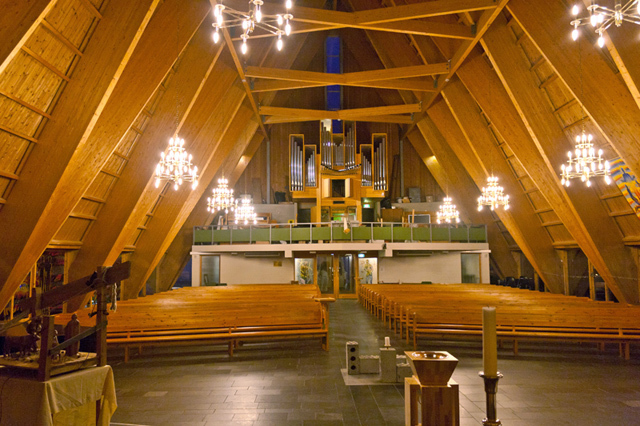 Runar Reknes wrote: The first installation in a Norwegian church? to my knowledge - yes. - and also AFAIK the largest digital installation with 16 speakers and dual speaker 16' SubHorn. We also tried out an expensive JBL PA sub, but that was just terrible - probably fine for disco, but it did not play notes at all below 60 Hz, just rattle. My SubHorn really plays notes pretty flat down to 23 Hz, and goes all the way down to 16Hz, but starts fading at 24Hz. Not a big topic in this church and their needs, very few 32' stops for their usage, but many 16' of course. The wooden reverb is not extremely long, but the acoustic is very nice, and adjustments and intonation did not reveal any big surprises, only a slight loss of the highest frequencies. All in all - a great reference, and I already have several cantors/wardens and organ committees that are eager to visit. Next time I am in Ålesund, I'll come and try it. Just a short follow up. I went down last week for final delivery and voicing of the selected main organ. Here are some images from the final product, showing the BDO30 concave/radial Pedals w/pistons and the 3 Swell/Crescendo/Expression pedals. 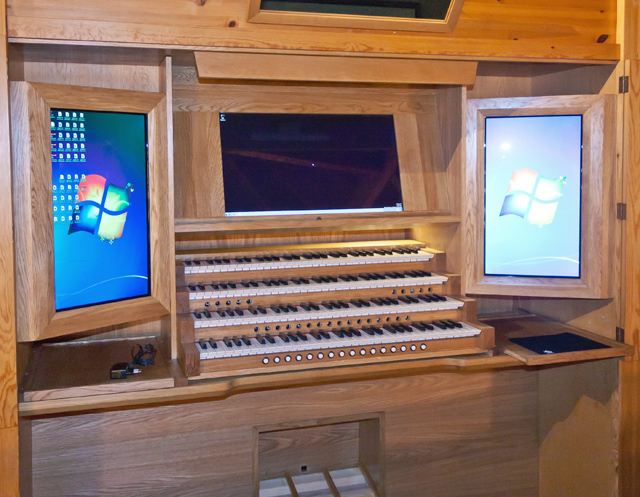 Another image showing the players view, and with the main Litomysl dry organ up on the touch screens. The young and very talented Jarle Fagerheim (user hovudverk on this forum) came along to help out for the final voicing, and to generally get an impression of such an installation. My ears are not what they used to be above 10 kHz anymore, and knowing that part of the intonation/voicing adjustments was going to be centered a lot around the Mixtures and the Quinte 2 2/3' I felt some younger ears was needed. And indeed they were. Congratulations etcetera with a really beautiful console. I'll take your word for it that it sounds impressive as well. Nice and interesting to have a look a such a different style of church - all that wood must have an influence on the acoustics as well. How long do you estimate the reverberation time? The wall structure is using glued laminated timber, also called Glulam, a structural timber product composed of several layers of dimensioned timber bonded together with durable, moisture-resistant adhesives. Also known as 'laminating stock' or lamstock for short. Those pillars and the wood planks between them are lacquered so they have a glossy and reflecting surface. The floor is covered with stony glossy plates. Low frequencies needs some mass to reflect well, and it seems the floor and the pillars give enough mass to handle this. Higher frequencies need glossy surfaces to reflect and the floor and the lacquered areas seems to give this as well. All frequencies seems to reflect about the same, although the higher frequencies seems to fade out a little faster - which is typical for many larger rooms. So, the reverberation is just around 2 seconds in this room, and since the speakers are inside the "old" organ box (behind the blind pipes) and since there are two speakers for each speaking position where one is pointing forward and the other is pointing more out to the sides, and since I am using speakers that projects rather wide, I am able to get pretty good reflections. The placement of the old "box" is rather optimal for the room, and the room reflections are very transparent and not complex. Last edited by etcetera on Wed Feb 29, 2012 10:59 am, edited 1 time in total. impressive! You can write more about the sound system? Andruss wrote: impressive! You can write more about the sound system? The main speakers are handling the 70-22kHz area. For the lowest frequencies I am using my own designed Horn Sub (with a horn length of 16' ) that handles the lowest frequencies from 23-90Hz. It plays below 23 Hz, but it starts falling off at this frequency, although I can feel the 16Hz as well, but then with a lower amplitude. Aiming for a true 16Hz would have meant a much larger and more expensive box, and was not deemed necessary here. 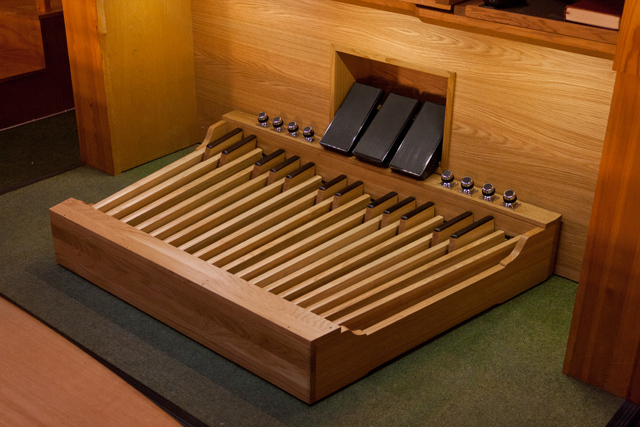 It is already quite big at 120x60cm (~47x23") and it's main purpose is to play all 16' pipes lowest octave perfectly.